A large gear ratio combined with an offset drive shaft assures both power and speed, while the Lean Burn control system reduces fuel consumption. 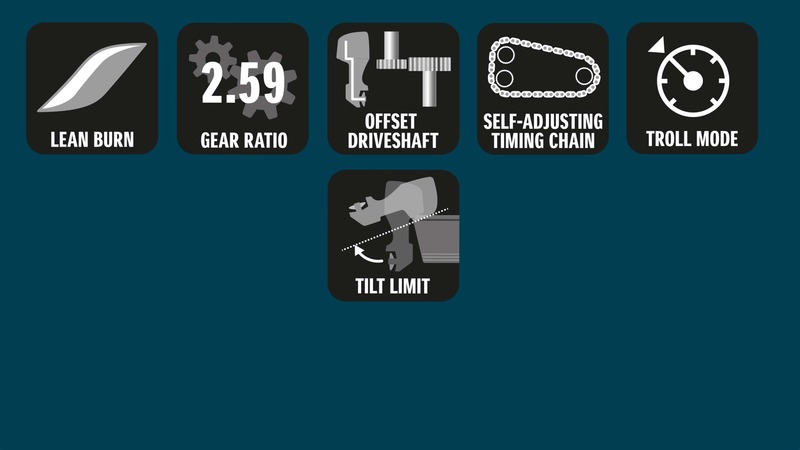 Simple, effective and maintenance free timing chain that runs in an oil-bath so it never needs lubricating and equipped with a hydraulic tensioner so it remains properly adjusted at all times. The O2 Sensor Feedback Control system helps maintain optimum engine operating efficiency across the engine’s full operating range. Propeller Selection (pitch): 15" - 25"
* Upgrade to Suzuki Multi-Function Gauge available, please ask your local Suzuki Authorised Dealer for more information.